It's taken me a long time to find a system of organising myself that works for me. 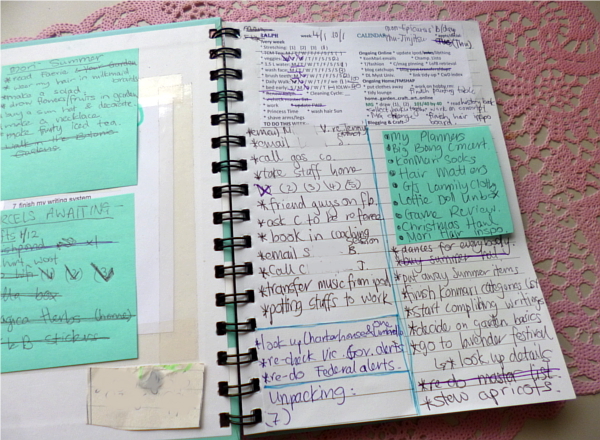 I've tried to-do lists, spreadsheets and apps. I've tried dividing up tasks in various different ways. I've read articles and books on organisation and time management, and even been inspired by a dream. For years I had a Filofax, but I started to find it increasingly tredious to find inserts for it. Plus it was boring having the same cover year after year. 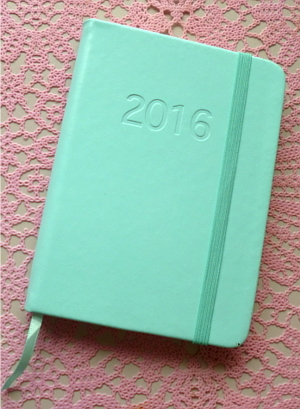 Having a whole new diary every year appeals to my sense of starting fresh. My diary this year is from Typo. 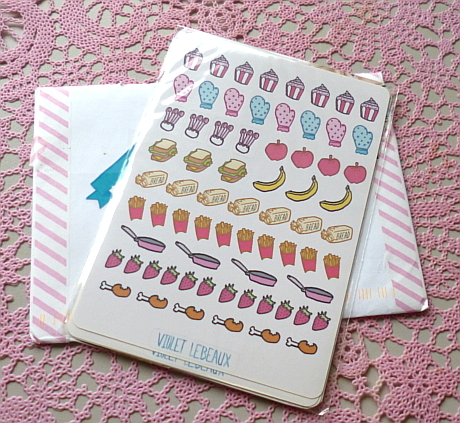 These sticker sheets were a huge amount of fun to work with! The high quality prints are made from Violet's watercolour illustrations. They're cut well with no white space around the edge, and come in lots of cute themes, like kitchen, craft and woodland animals. 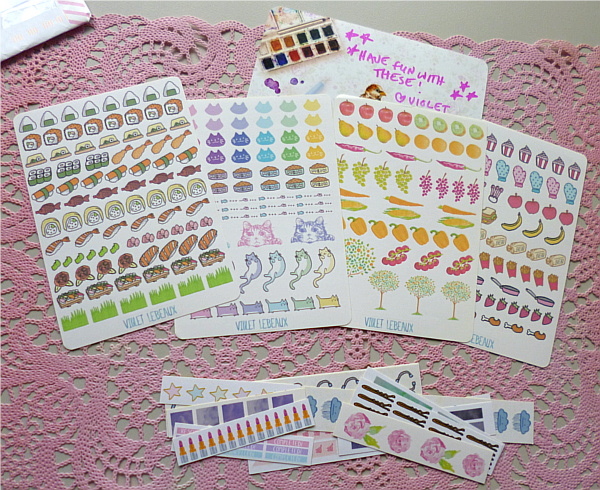 She also sent so many bonus mini sheets, I was overwhelmed! I would definitely purchase them again. Shopping local too, for the win! Back to the planners. I use my diary (or perhaps more properly an alamanac?) to record events that happen every year, like birthdays and festival dates, as well as one-off things like lunches and appointments. I have it set up at work where I can easily see the current week's page and grab it to write in new appointments. 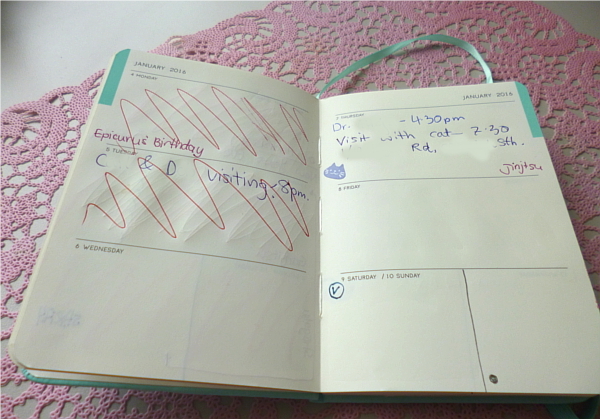 Each day I cross out the previous day. I will only take it home with me if I'm having an extended break or a very busy weekend where I might not remember everything I'm doing. The other book I have is my Ralph book. The name is a long story, but it comes from the dream I mentioned above. I'd much rather call it that, than something horridly sensible like an organiser. 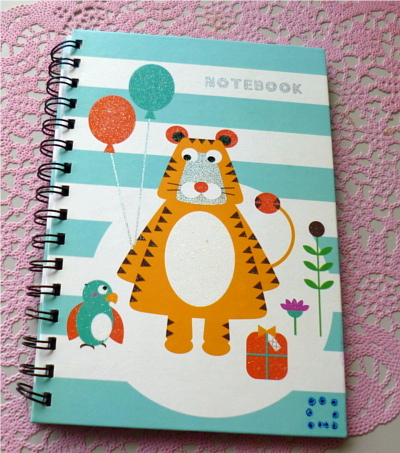 Ralph is just a normal hardback notebook from Daiso. It's basically my weekly to-do list. I take it with me wherever I go, and write down things I have to do in it as soon as I think of them. At the top is a pre-printed insert that I glue in. I made this up in Excel and I print out copies in batches. It has everything that I want/need to do on a daily or weekly basis, to save me from having to re-write it all every week. It's evolved over time depending on my interests and habits. Underneath is a free text section. On the left hand side I write the things I should/need to do. The right hand side is for fun or non-essential things, though I'm not hugely strict about the side things should go on. I do it this way because then I have a shorter list of things I have to do, and I feel less pressured. Every Monday morning, I tear out the previous week's page and copy over anything still to be done. Sometimes if there's a lot, I just cut out that part of the page and glue it onto the next page! I write suggestions for blog posts on a sticky note to make it easy to transfer them to the next week. 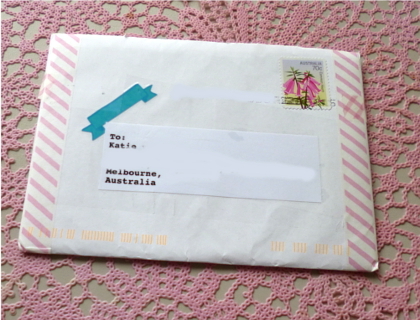 The inside of the front cover has sticky notes with other things I want to keep track of, like online orders that haven't arrived yet. Supporting this, I have a master spreadsheet. I had this idea about a year ago. My Ralph book is designed to work week by week, but it was getting bogged down with activities and ideas to be done further in the future. My list was getting filled with more and items that I couldn't/didn't want to do yet. It was frustrating. So I moved them all to a spreadsheet which I check once a week as I'm making up my new Ralph book page. If I think of anything during the week to go on the master list, I write it on the back of the current weeks' page in Ralph and add it to the spreadsheet the next time I look at it. A couple of days ago, I re-did my whole master list. I now have the 9 life aspects from the square I mentioned in my last post as headings. Although I'm not completely sure that this is the best way to categorise my to-dos, I'm glad I overhauled it because it gave me a chance to re-think about old ones and add new. So that's how I organise my life. I hope this post wasn't too boring, but I've spent over 5 years working on it, so I thought there might be some useful ideas in it for someone out there. Meet my New Fur Friend!